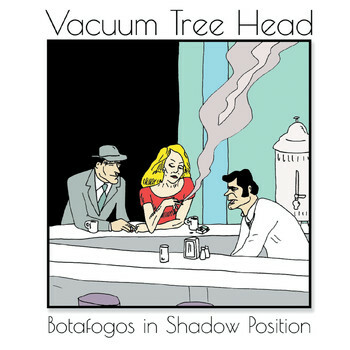 And suddenly, after about five or six years of silence, there are two new Vacuum Tree Head EPs. I think the last one I heard was Hypothetical Quandaries (n) from around 2012. I think there was a download of live recordings the following year, and a download of remixes / alternate takes and such, then nothing for a long time. As one might expect, the two EPs (Aasraa and the one currently under review, Botafogos in Shadow Position) are chock full of unusual drawings (a three-eyed elephant knocking down a spiral of dominoes, or several drawings of cat people, for example, all illustrations are by VTH founder-member Jason Berry (who plays soprano sax, electronics, glockenspiel, timpani, and voice on four of the disc’s six tracks, all of which are equally unusual in that they can involve a variety of sounds, and launch off in any direction at any time without warning; that’s the way VTH is and always has been — if you’re looking for something predictable, you’ve come to the wrong place. Also on board are the other VTH co-founder Michael de la Cuesta (synthesizer, tuned percussion), Stephen Wright (bass guitar), Justin Markovitz (drum kit, except one track where Thomas Scandura plays), Richard Barber (bassoon, processing), Kyle Bruckmann (oboe, english horn), Amanda Chaudhary (all kinds of keyboards), Thollem McDonas (electric piano), Richard Lesnik (clarinet, bass clarinet), and vocalist Amy X Neuburg, who sings on three of the tracks (two with lyrics). The compositions are the product of various subsets of members, and nobody here plays on everything. The whole EP is only a smidge shy of 19 minutes. Opener “Chualar Diorama” lounches with a powerful growling bass figure and chaotic drums, and with the intense wordless vocals tends to remind me of classic Magma. “DL / DS” again has the vocal power, though this time with lyrics, which they follow up with a sprightly instrumental jazz workout that grooves along nicely powered by the woodwinds and keys. “Linconlon Log” is a short piece in sort of a twisted chamber style, making use of bassoon and oboe alongside synth, glockenspiel, clavinet, and Mellotron. “Cushion Fortress” crawls along darkly and deliberately with powerfull bass and drums crossing paths with two electric pianos, one played conventionally, the other making electronic weirdsounds, with oboe, bassoon, and bass clarinet and a section for Neuberg’s vocals and lyrics. This and “DL / DS” are easily the high points, but truly this entire EP is a most unusual and wonderful slab of avant experimental rock. So what about Aasraa? Stay tuned.